A post went around earlier about the new Google logo’s file size, and it completely derailed my day, but in a fun way so I figured I’d share. 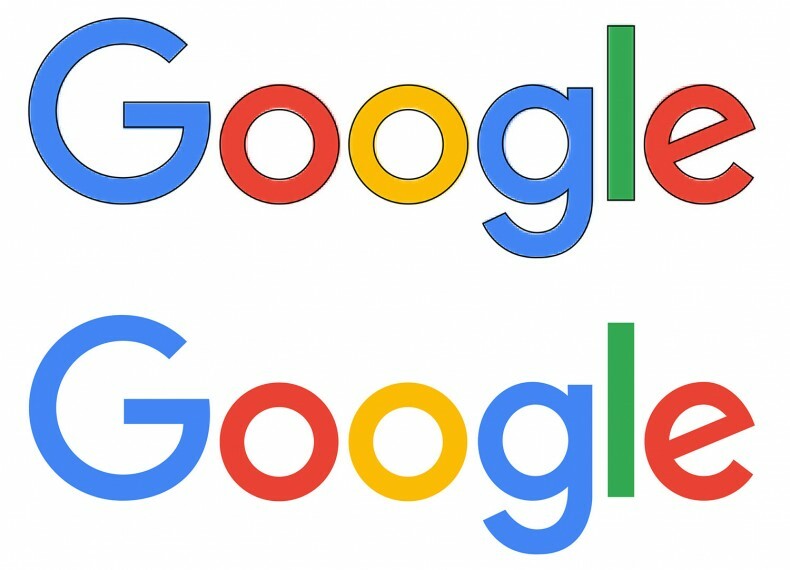 For more videos about the concepts behind the new logo and everything else, the post Evolving the Google Identity is a fascinating read. What spurred further exploration, however, was this post at Top 5 Techs about the file size of the new logo being 305 bytes in SVG format. Now THAT I had to play with. Off to Illustrator! This is ugly as sin, and weighs in at 1,559 bytes standard SVG, 604 bytes compressed SVGZ using just four shape types. And yes, I went in with a text editor to remove all the garbage Illustrator adds to SVG files. The new Google logo built with 10 circles, 4 rectangles, 1 polygon, and 1 Bezier path. Time to clean it up a bit! I took four of the circles (outside circle on the capital “G,” both circles on lowercase “g,” and the outside circle on the “e”) and made them ellipses to get closer to the actual logo. Not perfect, but much better. This file weighs in at 1,601 bytes standard SVG, 651 bytes compressed SVGZ. Not much of a hit for the extra code required for ellipses vs. circles! The new Google logo built with 6 circles, 4 ellipses, 4 rectangles, 1 polygon, and 1 Bezier path. And since I’d gone this far I figured it was time to go full Bezier paths for the three letters in question. The “o” are still built as a white circle drawn over a colored circle, I found that saved 549 bytes (!!) over making compound paths. The “l” is still a rectangle of course. I did a good job minimizing anchor points, but I must admit I’m not an expert with the Bezier pen. The “e” really needs more work, that’s kind of an ugly hump, but this had already taken up too much time! Anyhow, now we’re up to 1,789 bytes standard SVG, 885 bytes compressed SVGZ. The new Google logo in 4 circles, 1 rectangle, and 3 Bezier paths. I don’t see how anything reasonably accurate could be created in 305 bytes (if it’s true and it’s out there, I’d love to see the code), but even at 885 bytes for truly accurate logo using Bezier paths, phone users around the world can be thankful for the saved bandwidth.